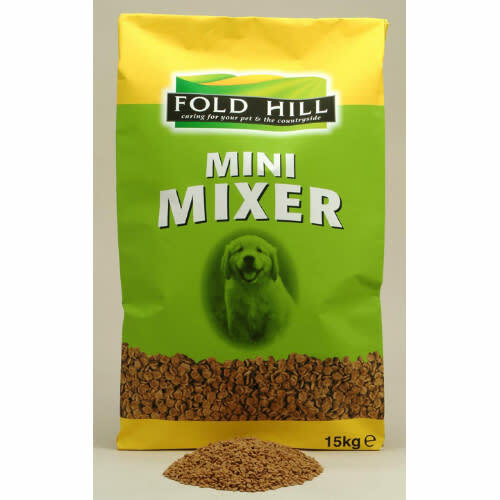 Fold Hill Mini Mixer Dog Food is carefully developed for puppies or small dogs, and with a coating of tasty meat juices and 8% oils. Mini Mixer is particularly kind to newly emerged teeth and the smaller mouths of miniature breeds. Feeding Guide: Introduce Fold Hill Mini Mixer at around 6 weeks of age, and continue feeding until the dog reaches adult age, when a change to Fold Hill Mixer is recommended.Fold Hill Mini Mixer can be soaked to assist young puppoes, and dogs with mouth or teeth problems. Feeding Guide for Puppies (amount per day). Mix with an equal amount of canned or fresh meat. A young puppy needs 3 or 4 meals a day but by 24 weeks this may be reduced to 2. Toy (6-16Weeks) 40-55g, (16-24 weeks) 55-80g, (24-36 weeks) 80-100g, (36 weeks onwards) 80-100g. Small (6-16 weeks) 55-155g, (16-24 weeks)100-125g, (24-36 weeks)125-150g, (36 weeks onwards) 150-210g. Medium (6-16weeks) 125-175g, (16-24 weeks) 157-225g, (24-36 weeks) 225-250g, (36 Weeks onwards) 250-300g.